Facilities: adequate bathroom/shower facilities. Showers were not coin-operated but took tokens – 25 cents per token for about 5 minutes. Which is reasonable. The only problem is that you have to buy the tokens at the office during the hours it’s open, so you have to plan ahead a little for evening or early morning showers. Neighborhood: The first and hopefully only time we had to move after setting up the camper (quite a hassle!) because of our neighbors. A group of 4 who were constantly smoking around their table so that it was hard to breathe on our assigned site. We tried to make it work, but we gave up and moved after dinner. Comments: If anyone out there can tell me how the word “Hiouchi” is pronounced, you get a prize. Picture of the site we didn’t stay on. But they were all pretty similar. Site description: Gravel space for parking, grass lawns. Neighborhood: Mostly retired RV-ers again, which seems to be the pattern as we get later into the fall, especially on weekdays. Comments: The “sounds of the sea” they mention seem to be barking sea lions which we heard from time to time all night. Not in a bad, keep you awake kind of way, though. It was fun! Facilities: basic bathhouse, coin operated showers; office has a basic store and is also a small restaurant where there seemed to be a lot of locals coming to eat, and where they make really good pizza. Neighborhood: quiet and spread out. A lot of people camped closer to the beach, but we avoided it because of high winds. The store/restaurant building with the bridge in the background. Another angle on the campsite. The beach was just beyond the bridge. What is it about majestic, ancient trees that they seem to embody wisdom? There are abundant examples in literature and film where aged trees become characters in the plot in some way. They are almost always mature, wise, and deeply respected. Walking through a redwood forest, where the tall canopy obliterates any view of sky or sun, gave me a deeper appreciation for the origins of these literary references. There is a sense that these trees have seen it all, across ages, and have endured. They are scarred by fires and acts of vandalism and yet they thrive. Most people speak with slightly lowered voices, as if out of respect for something they can’t quite identify. Not three-year-olds, but most people. Staffan wanted me to title this post with a reference to the land of the Ewoks, since those scenes from Star Wars were filmed in redwood forests. He even suggested that the post, or part of it at least, be written in Yoda-speak. Agree with this I do not. Take a very long time it would. Exhaust both writer and reader it would. Continue this way I will not. Can’t believe how little she looks next to that tree! Still hard to understand just how big and old these trees are! But our kids are not nearly this contemplative of their surroundings, and we were once again reminded that nature builds the best playgrounds. One of the great joys of this trip has been to watch them, particularly Emelie, explore and discover all of these different, amazing and unusual natural environments. Seeing them through her eyes too adds another dimension and usually deepens the experience for us. This one we could climb in! All 3 of us fit in there! … and this one she could climb on! When she ran in the ferns we couldn’t even see her! Here I am! The redwood forests have also produced some places for the grown-ups to play a little. No visit to the redwoods would be complete without visiting the drive-through tree. Today it would be illegal to do this kind of damage to a redwood, and the few drive-through trees that are available are all outside of the national and state park boundaries. But those that already exist are allowed to continue to operate. And it is definitely an experience. We decided to visit the drive-through tree on our way south and away from the main redwood area. It fit best with our driving route, but it also meant that we had the trailer with us. We asked at the entrance if we were allowed to drive through with the trailer or if we needed to unhitch it first. His response was basically that we could drive it through as long as we didn’t get it stuck. If I was driving, I would have been nervous enough about taking the minivan through. I would never have dared take the trailer through. But Staffan is a much more experienced and confident driver, especially when it comes to bigger vehicles, and he was sure it would be fine. If the side mirrors of the van fit, the trailer will fit. So I got a little nervous when the mirror on my side bumped a little and folded in, which impaired his view of the trailer. It just so happens that that window isn’t working, so I couldn’t put it down to flip the mirror back out, and there was certainly no way to open the door in there. But through we went. We gathered a little crowd of spectators, all of whom were expecting that the trailer would get stuck. But it didn’t. It fit exactly. As soon as the front of the van had passed through the tree, I jumped out with the camera to document the rest. And here comes the trailer! No wiggle room! We’re still not sure what “maximum age” means, but probably the oldest in a range of estimates? Either way, it’s old and it’s big! You need a bit of distance to see it, but the tree is definitely still alive despite evidence of fire on the trunk, and the giant hole that people drive their cars through. As we watched others drive through in smaller sedans and on motorcycles, I couldn’t help but think that we had had the bigger adventure. They all experienced driving through a tree, just like we did, but with plenty of room to spare and without the thrill of not getting stuck. I still wonder sometimes what would have happened if we had gotten stuck in there. Has anyone ever gotten stuck? I don’t know but I’m certainly glad it wasn’t us. After staying 3 nights in different parts of the Redwood area, it was time to continue south along the coast. We had wonderful adventures among the redwoods, but new experiences awaited us in the San Francisco Bay area! Heading south into California, our first stop was at the visitor center for Redwood National Park, which was surprisingly located downtown in Crescent City. What we hadn’t realized before is that, rather than being a national park with clearly defined boundaries, controlled entrances and all that we’ve come to expect from national parks, Redwood is actually a national park and several state parks spanning the area where the coastal redwoods grow. There are many entrances and exits, several major highways run through the area (rather than just one or two park roads), and we were very confused. But the ranger at the visitor center was extremely helpful, and was able to help us decide what would be best for us to see and do, and which routes to take. He also gave us some great tips about some other things we shouldn’t miss as we passed through Crescent City. The redwoods deserve, and will get, their own post after this one. But this post is about experiences in northern California that have nothing to do with giant trees. Crescent City is a coastal town, so our first stop after the visitor center was the Pacific Ocean. None of us had ever seen it, and when we got out of the car and smelled the sea air, we were longing for that first glimpse of the Pacific. And once we’d seen it, we couldn’t resist the urge to pull over, run down on the beach and touch it. It is a landmark in its own right – the world’s largest body of water. But it also had special significance to us on this trip. We had crossed the country, and as we stood with our feet in the Pacific, we had the sense of having reached an important milestone. To look out at the horizon and realize that I was standing on a beach in California was a surreal and happy moment. One of my favorite pictures so far. This one’s going on the wall when we get home! This girl loves the sand. Loves, loves, loves it. Covered in sand (some of us more than others, I’ll let you guess who), we climbed back in the car and drove to a cliff area overlooking the ocean where the ranger said there was a good chance of seeing whales. Well, we didn’t see any traces of whale activity, but it was still a beautiful view. From there we headed to a small marina where the ranger promised there were good views of seals and sea lions. This one did not disappoint! The docks at the marina were literally covered with them, and when we opened the car doors we were greeted by a chorus of sea lions barking. On one dock in particular we were able to walk out to a gate, and on the other side of the gate were all the sea lions. We could literally have reached out our hands and pet them if we dared (and it was all we could do to keep Emelie from trying). It was closer than a front row seat at any zoo or aquarium I’ve ever been to, and so fun to experience them in the wild like that. And it was free, which is always a bonus. So many sea lions! They were so funny, too. I just laughed and laughed. Zzzzzz. Sleepy sea lions. But a few were really barking at us! We shot some great video! We also, while in northern California, were able to get on Rt. 1 (the Pacific Coast Highway) at it’s northern endpoint and follow it down the coast. It was amazing and every bit as beautiful as I’d imagined it being. The coastline is so dramatic and varying, from pristine sand beaches to rugged cliffs. It seemed that around every turn was an image of white, foamy waves breaking against rocks, sending their spray up over a deserted sand beach. It was slower driving on narrow winding roads, and all the up and down didn’t exactly help our gas mileage, but the views were worth it. It would have taken us far too long to drive the entire PCH as we made our way down the coast, and sometimes we chose the interstate, but we were able to be on Rt 1 in parts of northern, central and southern California and experience the changing nature of the Pacific coast. Driving down the Pacific Coast Highway was something I’d always wanted to do, and it was an exciting and memorable drive. Hard to take pictures from the moving car. This one got a little bit of window reflection, but you get the idea. Here it went in from the coast for a little while, but under this amazing canopy of trees. Sparkling and radiant blue and surrounded by rugged cliffs, Crater Lake is instantly captivating and breathtakingly beautiful. We visited Crater Lake National Park on a sunny Saturday and spent the day exploring the park and once again marveling at God’s amazing handiwork. We drove the loop around the lake, which seems to be very popular with cyclists, and stopped at various overlooks and view points. The lake appears so different from different perspectives, including an island called the Phantom Ship, which depending on light angles, wind and water conditions, can sometimes be seen clearly and other times not at all. It resembles an old pirate ship, and its disappearing and reappearing act earned it the name Phantom Ship. After we’d circled the lake by car, it was time to lace up our shoes, strap Peter in the backpack carrier, and hike up to a watchtower for views that you just can’t get to with a car. It was a relatively short trail with a pretty steady climb up to the watchtower, which is still used occasionally by rangers watching for fires, though these days most of the fire patrolling is done from the air. Still loves being in the backpack carrier! When we’d finished our hike, it was already time to return to our campsite at Lemolo Lake Resort, about 30 miles outside of the national park, where we stayed Friday and Saturday nights. This family-owned campground is open year-round, and the family that lives there and runs it has to homeschool their kids because it is 80 miles to the nearest town. And for the same reason, we missed church that Sunday morning. We decided on Saturday night not to set an alarm and have a stressful morning with an early deadline to pack up the camper and get on the road all in an effort to make it to a town in time for worship. Instead we took our time and when we hit the road, we were California bound! 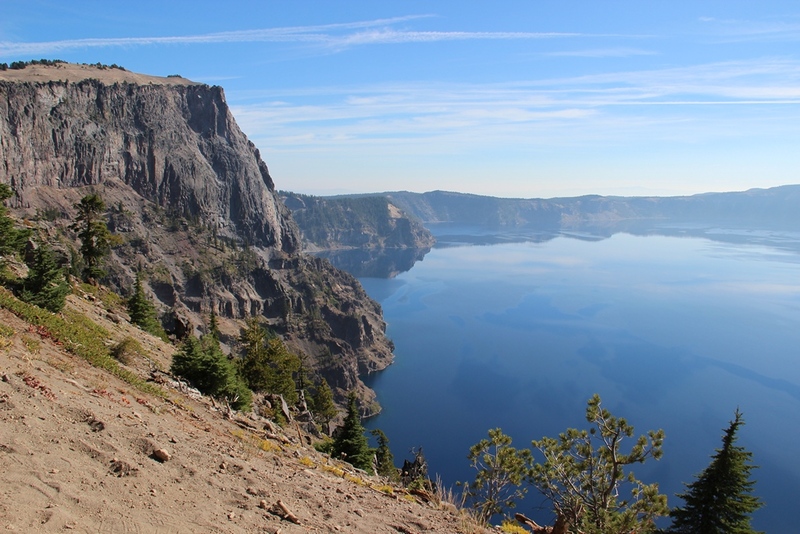 Location: relatively easy access to Crater Lake National Park. There are also some other lakes in the area. Otherwise, it’s close to nothing. Facilities: Bathrooms were rather primitive but had flushing toilets and running water. Showers were coin operated and cost $2 for approximately 3 minutes. No thanks. No playground, no wifi, no place to wash dishes. A basic campsite with electricity and water. Site description: grass and gravel. Lots of trees and plenty of shade. Neighborhood: Lots of families with kids, plus retired RV-ers and others. No problems with noise at night. We didn’t really have much contact with our neighbors. Comments: Behind the office/restaurant building is Lemolo Lake, which offers fishing. When we were there, the water level was so low that the docks was just sitting on the beach. It was a pretty view though. In Portland we got to visit more friends from Sweden, the Lanns. At this point, about halfway into the trip, we were ready for a break. A sort of vacation from our vacation. Jonas and Greta were so generous as to be our home base for a little travel reboot. We stayed 3 nights (2 full days). The original plan had been to do the “reboot day” on the first day and then “do” Portland on the second day. But at the end of the first day, we felt like we could really use a little more reboot time, and we couldn’t think of a single thing that we were just dying to do in Portland. So we hung around the house again for a second day. It wasn’t glamorous or exciting, but one thing we’ve learned about traveling for this long is that you just can’t do glamorous and exciting everyday for three months. Our bodies wouldn’t hold up, our minds and hearts wouldn’t be able to process it all, and our budget wouldn’t survive. Our kids got along great with their kids, and they had a great fenced-in yard where they could all play together. While they did that, we took the chance to clean out and vacuum the car and the camper, resort, reorganize and restock our supplies, catch up on laundry, and all the little things that we often don’t have time or energy for in the midst of our travels. We even washed the car seat covers – not that they stayed clean for very long. Staffan and I each had an afternoon to run errands that we needed to run – by ourselves. While we feel incredibly blessed to have so much time together as a family, alone time is not so easy to come by and yet still necessary for everybody’s well-being. For me that was a trip to Target, Trader Joe’s and Starbucks, plus time spent driving there and listening to something other than Veggie Tales. Sometimes it’s all about the little things. The girls playing with a bubble machine! We slept well, we were fed well, the weather was great, and there was time and space for things like exercise and watching the season premier of Grey’s Anatomy. We are so thankful to the Lann family for fitting us in to their busy work-school-homework-soccer-practice-dentist-appointment week. Sometimes, even in the midst of an amazing trip like the one we’re on, a little bit of normal is exactly what you need. We left feeling refreshed and ready to take on new adventures, like those that awaited us in Crater Lake! As we headed south from Seattle toward Portland, we realized that Mt. Rainier wasn’t far off of our route. Since we needed a stop somewhere to break up the drive anyway, we decided to make Mt. Rainier that stop. We found a campground online called Mineral Lake Resort, and from the website it looked like a great place. And that just proves how easy it is to misrepresent yourself on the internet. It wasn’t terrible, and perhaps during peak season it’s better. We think it may have officially been closed for the season. Someone just happened to be there when we pulled in and told us it was okay to camp for the night. He was on his way out, but he’d be back in the morning to take care of payment, etc. He also mentioned that they were working on their plumbing system so there was no water and the bathrooms were locked. Hmm. We had filled our water jug before we left Seattle, and there was a portable toilet. It was just one night, it was getting late and we didn’t know where else to go. So we stayed. There were some other RVs that seemed to be permanently parked there, but I’m pretty sure we were the only people there that night. It was strange. Camped in the strange gravel parking lot. In other news, my daughter prefers not to wear pants. Sometimes it’s just not worth fighting. Another angle on the parking lot. Nothing says class like spray painted site lines! In the morning, when Bill didn’t come back when he said he would, we decided to head into the park and come back in the afternoon to pay for the site and pick up the camper. As we entered the park, we were struck by the lush forest at the base of the mountain. It was green in a way that I’ve rarely seen before. It’s difficult to describe, but it was beautiful. And chilly. As we drove deeper into the park and ascended the mountain, the temperature continued to drop and I started to wonder if we’d brought the right clothes for a hike in the damp, cool, cloudy weather. Little of the mountain was visible behind the clouds, except for a few brief moments when the clouds parted a little and we caught a glimpse of the mighty mountain. We took a short hike to a waterfall on a trail that was paved and wheelchair/stroller accessible. At the waterfall, we sat by a bridge and ate our packed picnic lunches. Then it was time to head back to the car and back to get our trailer. Waterfall view. We sat beside the bridge at the top to eat lunch. By this time, Bill was back. We paid for our campsite, hooked up the trailer, and headed south to Portland. Interesting church in the village of Elbe. One of the smallest in America. 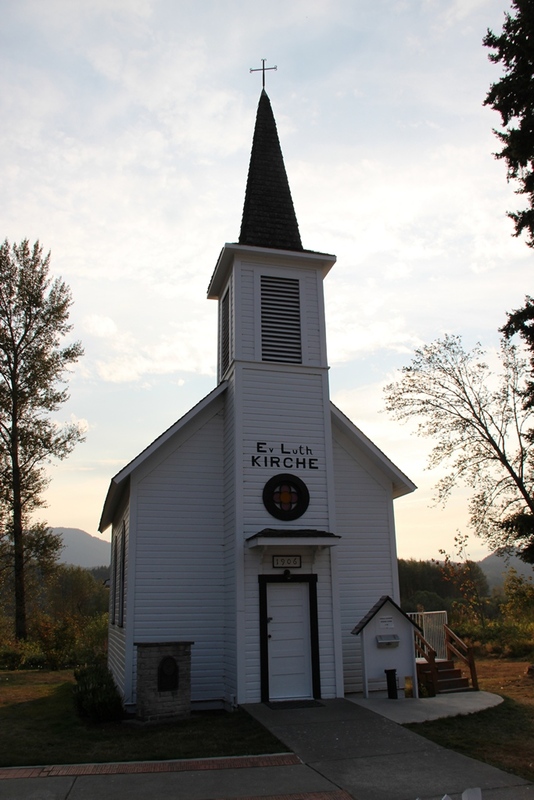 According to the sign, it is the seat of the area bishop, who holds monthly services there from March through November. Out of respect for tradition, he arrives there by bicycle. Location: just outside the town of Elbe, about 20-30 minutes from the entrance to Mt. Rainier National Park. On the shores of Mineral Lake. Facilities: We never saw the bathhouse, so it’s hard to say what they have in-season. For us, electricity and a porta-potty were it. And the porta-potty was a bit unsteady and needing to be emptied. There is a dock for fishing on the lake, but it was badly in need of repair. Neighborhood: No neighbors at all. Quiet, but a little disconcerting. Comments: In my opinion, if you call yourself a “resort” you should have a little more than a gravel parking lot to offer. Maybe even running water. It worked fine and I’m not complaining, I just found it humorous that this of all places calls itself a resort. Assuming that our trip is 10,000 miles (which we’re now thinking is a pretty big underestimate), then 5,000 miles would be the halfway point distance-wise. 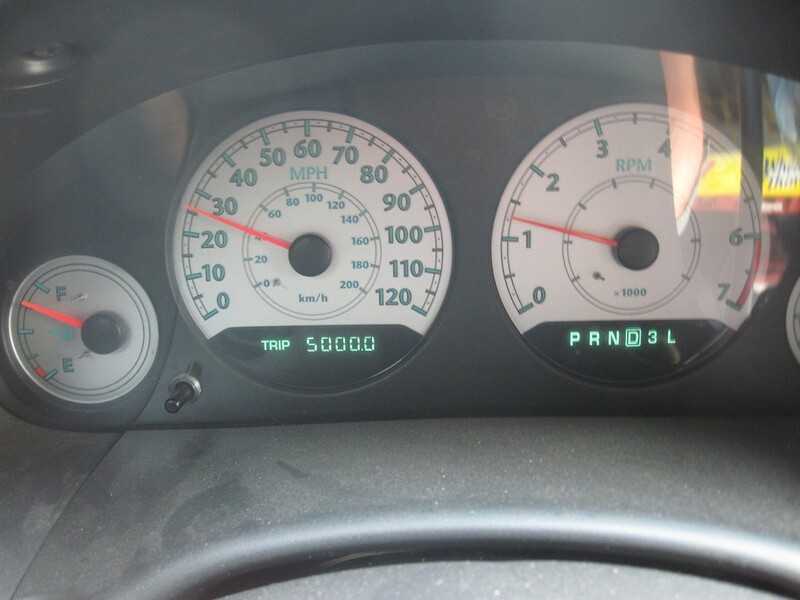 Our trip odometer reached 5,000 miles exactly on September 24, not far from Mt. Rainier in Washington. If our trip is 90 days (which seems like it’s probably a pretty good estimate) then the halfway point time-wise would be day 45, October 3. Price: $42/night, after KOA member discount. Thus far one of our most expensive. Location: Well, that’s why we stayed there. Easy access to Seattle and for us, close to our friends. Facilities: Bathrooms were nice and clean, but the showers had very poor water pressure. And by very poor, I mean it probably would have been easier to use the water fountain to get the shampoo out of my hair. The playground looked like it was a great one, but we didn’t actually use it. Site Description: Grass and gravel, literally 1 pop-up + 1 minivan + 1 picnic table wide. 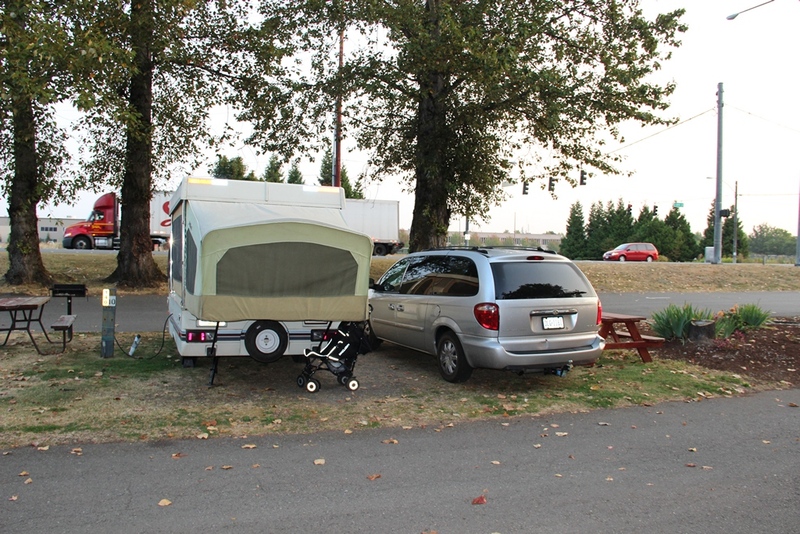 A pull-through site, approximately 1 pop-up camper in length. There was not a whole lot of wiggle room here. If we didn’t park the minivan in just the right spot, we either couldn’t open the van door because of the picnic table or we couldn’t open the camper door because of the minivan. One of the tiniest campsites I’ve ever seen. And while this wasn’t true of all sites, our site was very close to a major road where there was considerable traffic noise all night. Neighborhood: The usual mix of retired RV-ers, families, etc. Also a group of bikers who liked to make noise (both themselves and their motorcycles) late at night. Not my favorite neighbors. Comments: It was the right choice for us all things considered, and if I had to do it over again, I’d probably make the same choice. But we did decide to leave after 2 nights instead of staying for 3, mostly because the quality we received didn’t really match the price we were paying. Ah, Seattle. Home of the Space Needle, Boeing Airplanes, the original Starbucks, and our good friends, the Christs. Keegan and Becka used to work with us for Young Life in Sweden, and are now working for Young Life in Kent, WA. Their daughter is about 8 months older than Emelie, and their son just 5 days older than Peter. It was a joy to catch up with these friends and to see a little bit of Seattle. It was also a little glimpse of what life could be like with two sets of twins under 4. Scary. After the usual arrival, catch up and settling in stuff, we had dinner and went with them to the local high school football game. It was a late night for the kids and somehow Peter managed to fall asleep amidst the cacophony of marching band, cheerleaders and cheering fans. Emelie was captivated by the whole thing and loved watching all the big kids chasing the ball around the field. Her favorite, though, were the “ballerinas” at half time (a dance group that was kind of like color guard minus the band). The next day, Sunday, we went to church with them at the Covenant Church in Kent, then drove to the ferry that would take us across the Puget Sound to downtown Seattle. We walked to the famous Pike Place Market and saw all the beautiful flowers and the place where they throw the fish. The fish place was disappointing, though. I thought they threw the fish to (at?) the customers who bought them, but it’s just that one of the employees comes out among the crowd and they throw it to him. They also can’t sell the ones they’ve thrown, since apparently it damages the fish, so they don’t do it that often. I’m not sure why they do it at all except that huge crowds gather and watch for it, so I guess it’s cheap advertising. It’s a great market, though, and full of life and customers on a Sunday afternoon! The whole gang (minus Staffan, who’s behind the camera). Lunch on the ferry. Holding hands in the market on a crowded Sunday afternoon. We didn’t lose anybody! Back on the city streets, we watched cheese being made through the window of a cheese shop, saw a street musician with an upright piano on a street corner (how did he get it there?) and then Emelie got to hold a snake at another street “performer” (her credentials badge from the city was a street performer’s license, but really she was just letting people pet her snakes so it wasn’t much of a “performance”). She loved this. Not even a little bit afraid. I love that she’s fearless like this. She doesn’t get it from me. It was a fun day and Seattle was a fun city, but we were all getting tired. So, after a little ice cream break and a bit more walking, we got back on the ferry and went back to our cars. Monday morning we had a little more time for visiting and then it was time to move on. After weeks and weeks of driving west, it was time to try a new direction: south! Becka with Peter and Kai on the ferry back. Next in the American City Pronunciation Challenge: Spokane, Washington. I had to explain to Staffan that while phonetically he was right to say “Spo-cane”, the name of the city is actually “Spo-can”. Our visit in Spokane was short and uneventful. While we were driving from Deer Lodge, our friends in Seattle called. His mom lives in Spokane – would we like to set up camp in her driveway for the night on our way to Seattle? A house and a free place to camp for the night sounded great to us. Unfortunately, they were away for the weekend. But they were so generous to let us stay there anyway! So we set up camp in their driveway and took advantage of being in civilization by stocking up on groceries, going to the bank, and other boring but necessary tasks. We also took advantage of being at a house to do luxurious things like putting a frozen pizza in the oven for dinner, giving the kids a bath in a tub, and eating ice cream and watching a movie after the kids were asleep. We hadn’t stayed at someone’s house since Ohio, so all these “everyday luxuries” were especially appreciated. We’re so thankful that they let us stay there! I guess this is a short and boring post. We didn’t do much and we didn’t take any pictures. Can we say we’ve really seen Spokane? Maybe we can’t. But it was a great place to stop as we continued our journey west.